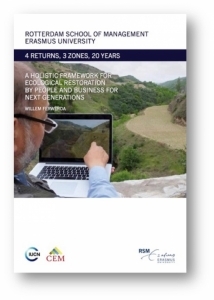 In 4 returns, 3 zones, 20 years: a holistic framework for ecological restoration by people and business for next generations, Willem Ferwerda, executive fellow at Rotterdam School of Management, Erasmus University (RSM) provides a systemic framework to ensure the productive involvement of both the private and public sector in ecological restoration efforts. This framework creates a general understanding among all stakeholders and builds bridges on ecosystem level. The ‘4 returns’ framework can serve as a practical guideline for everyone working towards creating the restoration industry. The UN Sustainable Development Goals and the World Business Council on Sustainable Development’s Action 2020-plan identify conserving and restoring ecosystems and preventing their decline degradation as key to a sustainable future. There is also more awareness about the connection between healthy ecosystems and a healthy economic system. And, business leaders worldwide understand that exclusively looking at the maximisation of the financial return on investment per hectare leads to degradation of ecosystems. Innovative consortia of frontrunners in the investment world, companies, farmers, foresters, local entrepreneurs and ecologists are taking the first steps towards the creation of a ‘restoration industry’. The challenge will be how to scale up restoration projects that align all stakeholders. “Multi-stakeholder ‘ecosystem restoration partnerships’ with local landowners and users, investors, businesses and governments are the answer,” says Ferwerda, adding that this brings together finance, local knowledge, business rationale and science. “Long-term partnerships are a requirement for the successful execution of the work that needs to be done,” he says. To further enable this process, Ferwerda says there is a need for a common language and framework that all stakeholders understand. This framework is exactly what we describe in the publication. To restore living and productive landscapes, Ferwerda’s strategy is to build bridges between these farmers and landowners, investors, companies and governments. “It’s not an easy way, but we believe that this ‘4 returns framework’ is the best way to achieve long-term landscape restoration successes,” he says. The publication was officially handed to Monique Barbut, Executive Secretary of the UN Convention to Combat Desertification during the UNCCD COP12 Conference in Ankara on 19 October 2015, and will be handed to Dutch King Willem Alexander during his state visit to the restored Loess Plateau in China on 27 October 2015. Willem Ferwerda has a long track record in conservation, ecology and business. He is executive fellow business and ecosystems at RSM, and special advisor to the Commission on Ecosystem Management of the International Union for Conservation of Nature (IUCN). Ferwerda is initiator and CEO of Commonland, an organisation that makes restoration happen based on return of inspiration and return of social, natural and financial capital.